Shivsu Canadian Clear is one of the member of the Shivsu Canadian Clear Group of Companies. Shivsu Canadian Clear has incorporated the state of art technology in design engineering of filling machines being manufactured. CC 600 fully automatic filling and capping machine and semi automatic rinsing is specially designed by Shivsu Canadian Clear for mineral water bottles and carbonated beverages. The entire process has provisions in the filling machines for rinsing, filling, capping and sealing. The entire process is controlled by a PLC with sensor Controls with one touch instrumentation systems. The whole equipment is sleek and is capable of bottling various sizes of bottles ranging from 200 ml to 2 ltrs. 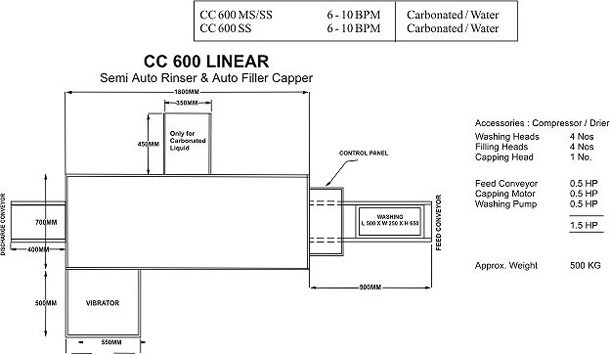 The mineral water pet bottles / carbonated mineral water bottles are fed into the Input Feed Conveyor of the CC600 after manually rinsing them in the semi automatic rinser. The bottles go automatically on the conveyor to the filling station. Optic Sensor senses the bottles and allows only required amount of bottles to enter the filling station. Special pneumatic robo's hold the bottles by the neck and body prior to the filling heads descending into the bottles. The filling is very accurate and is done by the neck and body prior to the filling heads descending into the bottles. The filling is very accurate and is done by specially designed CC316 ? 3 way filling machines. Filling system is incorporated alternatively for counter pressure as well as volumetric filling. The filled bottles then go to a cap pickup system where they pick up caps before being capped in the capping station. A special vibratory cap feeder provides proper orientation to the caps. The capped bottles are then send out to the discharge conveyor. Shrink Labeller is provided on the output conveyor. Ozone Jets to disinfect caps. Filling Machines are designed either for carbonated or non-carbonated liquids.